Don’t let the beautiful scenery fool you. As peaceful and relaxed as it might seem at first glance, Constanta is a very dynamic market when it comes to advertising. Still with a long road ahead until it catches up with other Romanian cities, players say it’s a market full of entrepreneurial spirit and passion to make it big. Doing a simple Google search, one may be surprised by the number of agencies in Constanta (50), many of them presenting themselves as full service, with around 10 offering online solutions. However, most do not in fact offer the full spectrum of services and, where they do, they outsource some to smaller agencies. His colleague, Florin Tircea, chief executive officer at Global Advertising, agrees that many clients don’t understand the importance of online done right, the firm’s correct positioning online. “For instance, many companies give up on Facebook after their first campaign if they don’t see results and conversions right away. I believe that success is exponential: you need to have several campaigns done right in order to achieve your goals. It takes a time until your potential clients see you and perceive you on the market as you want them to. Moreover, a company shouldn’t expect to invest a little, one time, and to have success immediately,” said Tircea. But the problem lies also with the services suppliers. Working with “the guy from the third floor” or a “garage company” will generally not give you the right results, especially if you want quality. And, unfortunately, according to the Global Advertising representatives, sometimes the same applies with big full-service agencies that don’t have the specialized people for online, but who overcharge their clients, with the final executions being mediocre. “Let’s not forget that in 2016, companies in Romania invested around EUR 41 million in online promotion (Facebook, Google ad words, etc), only 6-7 percent of which came from Constanta. The cities that dominate are Bucharest, Iasi and Cluj. And in 2014 the market was around EUR 25 million. The growth is very low, in our opinion. The market is advancing pretty slowly,” they commented. Launched in 2017, the agency is expanding, offering the development of web solutions, data centers and marketing online to clients especially in the hotels, catering, restaurants, medicine, fashion and even advertising areas. 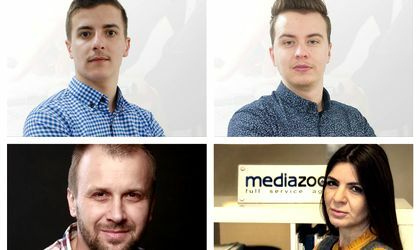 According to Cristiana Dima, managing partner at Media Zoom, in Constanta, most companies have a specific area of ​​activity, such as crewing or shipping, and do not need a generous marketing budget. The big chain stores have all their marketing activity coordinated from Bucharest. Therefore, agencies in Constanta are left with small and medium-sized firms that take promoting decisions based on price. “It is a real challenge to work on the advertising market in Constanta, because the effort is bigger than in the rest of the markets in the country, sometimes double or even triple, due to companies’ small marketing budgets, the lack of qualified staff in the field, the predominant factor in decision making – namely cost and not quality – and especially the barriers that clients put in front of the agency, with the pretense of ‘knowing better’ how their advertising should look,” said Dima. In order to survive the market and carry out quality projects, the company’s representatives have chosen to collaborate with big players in Constanta, who have dedicated marketing people in their teams, and with other firms in the country, especially those in Bucharest. Over 80 percent of the agency’s clients hired them on the recommendation of existing clients. Media Zoom is an advertising agency that boasts of offering a wide range of services, such as branding & design, shopper marketing, promotional/experiential marketing, relational marketing, production, interactive marketing, advertising, and communications planning. It has worked for brands such as Lays, Campari, Pepsi, Aperol, Prigat, Chevrolet and Mazda. “Media Zoom started its activity even during the crisis’s start-up and I think it has benefited us. We entered the market with competitive, well-calibrated prices that brought us customers, we managed to make a profit even during the crisis and to grow every year. Before being an entrepreneur, I was a very demanding customer. We have built our business very carefully to compensate the market gaps. Media Zoom offers its customers besides high-quality concepts and graphic services, consultancy. We also understand the importance of honoring promises: respecting deadlines, respecting submitted offers, respecting the promised quality. The Media Zoom team has people with more than 15 years of experience in the field. There are many projects we are proud of and we have many clients whose trust we enjoy. The fact that we have been working with PepsiCo since 2010 and with Reckitt Benckiser since 2012, a client with which we have developed many national projects, makes us proud of our work and motivates us to be better every day. In 2017 we added several major nationwide clients to our portfolio. In 2018 we plan to invest in performance equipment and personnel. The concept of training remains important. We need to be connected to everything new on the market to offer our customers the best deals. In figures, we are targeting an increase of at least 40 percent,” said Dima. Coming back to the market, the Media Zoom manager points out that few managers understand the complexity of the domain and choose to follow the agency’s proposals in terms of concept and message rejection. “Those on the same side as us understand and know that in order to be a good advertiser (person or agency) one must have knowledge of many fields, such as: economics, psychology, sociology and design; one needs an overview of the market and to find the right strategy for a product or service. Not all products and services work with the same strategy, the same message, the same communication channel,” added Dima. Still, when it comes to creativity, she believes that clients in Constanta understand that differentiation in the market is influenced by the creativity of the material used in the promotion, although they are in general less open to bold ideas and less willing to invest. Online is not a well perceived media channel. “Companies have a perception of what is the right way of doing things, and mostly choose to invest in an outdoor banner rather than an online campaign – forgetting the fact that Facebook has the largest client database available,” said Florin Tircea. In his turn, Alexandru Angheliu, manager of Touch Media, says the advertising market in Constanta can be summed up briefly: at the beginning of the road, with a real and conscious market only in the outdoor and indoor advertising sectors. “And outdoor is limited to traditional banners, mesh banners and other types of outdoor advertising that we find crowding any intersection. There is where budgets go and, at the beginning, it affected our activity a great deal, because Touch Media is an agency that offers web, marketing online and branding services. From my point of view, Constanta is still a latent market, with opportunities closed to many agencies that don’t perform in ATL or BTL,” said Angheliu. He founded Touch Media in 2004, as the designer and only employee. In 2006 the agency entered the web development market in Constanta, at a time when companies were starting to invest more and more in websites, and over 2008-2009 Touch Media expanded its activities and started to work for companies in Bucharest, Brasov, Timisoara and Cluj, which allowed it to attract bigger companies into its portfolio and work at a higher level. But the real growth came when the firm entered the international market and started working for two clients in Canada, followed by Germany, Belgium and the USA. The agency concentrates more on its operations with the foreign countries in its portfolio, but the next target being conquering Bucharest. According to Angheliu, the agency is growing organically, without marketing or selling efforts and they are choosing their clients carefully. “The Constanta advertising market is shared by some medium and big agencies that are known in the city. We take every project from sero, create the design without copying, without using templates. For me this is the natural way of doing things as I am a plastic artistic by formation, a thing that made me have an exigent look on the esthetics and visual side of a project,” added Angheliu. His analysis of the market as closed is echoed by Media Zoom’s managing partner, who blames this on agencies and clients not being motivated enough to offer more: the client – a larger budget; the agency – more creativity for projects. “The value of the advertising market in Constanta does not exceed EUR 1.5 million, including the marketing budgets of state institutions. Still, the Start Up Nation Program is an opportunity for Constanta’s advertising market, given that many young people have chosen to take the path of entrepreneurship; they understand the field better than older generations and are aware of the importance of advertising in promoting a business. They even choose to consult a specialist in the field. I see another opportunity for the development of the advertising market in the education of small entrepreneurs and their guidance to BTL, towards the marketing experience,” added Dima. When it comes to the Constanta advertising market’s power and growth potential, Dima predicts that it will take it another three to five years to reach Bucharest’s level, and only when it comes to the level of knowledge and professionalism. As for creativity, the Touch Media manager is not positive, in general, but has hopes the situation will improve. “For sure, Constanta also has companies that understand advertising and media, what it means to plan a budget, and that accept creative ideas, those being the ones we want to attract. There aren’t many, but we have started to work with those that are open and some of them have grown and even become our friends in time. Opportunities exist for those who know how to take advantage of them. The only problem is that sometimes those opportunities are in contradiction with values and the way one might see their business,” added Angheliu. On the positive side, he points to the digital workshop opened by Google in Constanta, which offers support to small companies that want to invest, and explains to them the benefits of investing in online. And although there is a long road ahead for Google, Angheliu thinks that it represents an open door that will be seen and will have an impact on the way companies in the coastal city handle their online budgets. “The advertising market in Constanta has developed with the explosion of the smartphone market. There are many clients looking to invest in having their own apps. Bear in mind that Constanta is not growing like Bucharest, Cluj, Timisoara or Iasi. Constanta has its own rhythm; it’s an atypical market. There is capital to be invested in this city, but the IT and advertising still have a lot to learn and grow. While in Cluj-Napoca or Bucharest we can talk about a mature market, in Constanta advertising is still in its adolescence, and I believe it will remain like that for some years to come,” predicted the Touch Media representative. Still, he tips the growth of IT in Constanta, which has to attract very big projects from outside the city and even outside the country in order to raise the level of fees. “Only then can we talk about real and important growth. And that also depends on the IT and advertising companies in the city, but the ones that will have a word to say in the end are the IT ones,” concluded Angheliu.